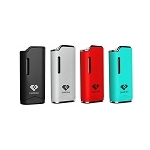 The Evolve 2.0 All in One Vaporizer offers an advanced variable output battery with interchangeable pod attachments compatible with a variety of material types. 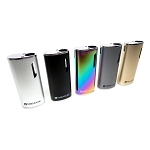 Right out of the box the Evolve 2 Vaporizer is equipped with a pod designed for thick concentrated oils. 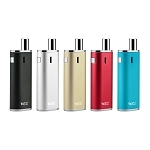 It's sports the Yocan classic quartz dual coil design for efficient heating on the go with unmatched flavors. You are also provided with two other options that are designed for thin oils and e-liquids (Green for Oils/White for E-Liquid). Each feature an easy top fill method that allows you to quickly refill up to 1.0mL with absolute no waste/mess. They heat your material with an advanced wickless ceramic core that will deliver a world's of difference when compared to the traditional cotton wick style. 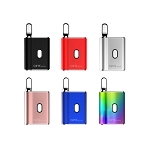 Yocan incorporates three preset voltage settings optimized to cover your needs with each pod attachment. Quickly press the power button 5 times to power the battery on and then three more times to change it's power output options. Watch the LED power light cycle through three unique colors to indicate each voltage setting and find the one that works best for you (White 3.4V, Blue 3.8V, Green 4.2V). Before your first use press the power button 2 times to activate a preheat cycle and get the absolute most out of your experience. The Evolve 2.0 is equipped with a huge 650mAh capacity that will keep you powered all day long easily. When the time to recharge eventually comes it supports passthrough charging for those times that you really just can't wait. Invest in yours today and quickly switch from one material type to another on the go whenever the occasion calls! Add Evolve 2.0 Pods 4 Pack: Include a pack of pods in any type of your choice of above now and save in the process. Don't wait until you're original dies out, they're discounted here!